Holiday Shopping at the Fort Collins Winter Farmers Market! Hope everyone had a great eclipse holiday! Even though your farmers didn't get to travel to a totality locality, we still were able to enjoy the magic from the tomato tunnels. Pretty crazy experience! Now that it is a bit dryer, your farmers have been busy this week trying to figure out our new carrot harvester. It actually works pretty well for a machine from the 1970s but now we have a materials handling problem. The machine is too fast and we can't keep up with the washing and packing logistics. Its always a new challenge here! 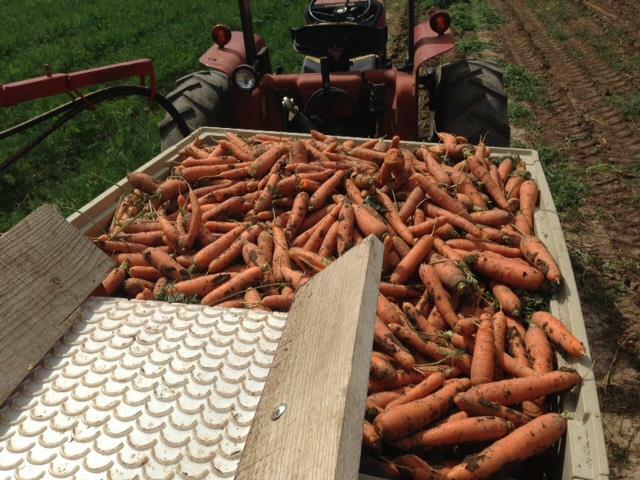 Speaking of carrot harvesting, I'm sure that you have noticed that we have been bagging our carrots at the market rather than bunching them. No one seems to be complaining, but we changed because it is more efficient for the farm and there were enough folks at the market asking us to remove the tops before putting them in their bag. We figured we would make it easier for everyone by getting rid of the tops ahead of time and giving you a handy bag to store them in. Winning! Its back to school time and we have lots of healthy, delicious stuff for sack lunches. Carrot sticks, sweet peppers, sun gold cherry tomatoes, and fresh green beans all are easy things to pop in lunches to ensure your kids are eating well even when they aren't home for the summer any more. We are at the glut of heirloom tomato season! The plants will be producing high volumes of tomatoes for the next two weeks, so take advantage! Last night the whole family enjoyed BLTs with a side of oven crisped new potatoes. Talk about a satisfying meal. New potatoes are great for all sorts of stuff including potato salad, hash browns, and just plan roasting. I'm thinking of a new potato skillet hash with onions, cabbage, and sweet peppers. New potatoes have a thin skin, so store them in a plastic bag in your fridge until you are ready to eat them. This week we have Yukon Gold at the stand, but may have some other varieties coming down the pike. We will probably start to have flats of heirloom tomato uglies at the market this week. Not sure how many we will have but ask at the market stand if you are interested. Boxes of romas will be coming on strong soon. © 2019 Native Hill Farm. All rights reserved.